Rapilose® Oral Glucose Tolerance Test (OGTT) Solution is a cost efficient and ready-to-use glucose solution, designed for use in glucose tolerance testing to screen for gestational diabetes and diabetes mellitus. Each 300ml pouch of Rapilose® OGTT Solution contains exactly 75g of anhydrous glucose, which is the adult dose recommended by WHO in glucose tolerance testing. Rapilose® OGTT Solution comes in a ready-to-drink format with in a 300ml aluminium foil pouch with a tamper evident twist-off cap. Rapilose® OGTT Solution is an easy to drink, pleasant tasting orange-flavoured solution that is non-carbonated and contains no colour additives. It is also gluten, lactose, fat, caffeine and alcohol free. With no pre-mixing or measuring required, Rapilose® OGTT Solution is convenient for accurately administering the required dose without any preparation. It can be stored on-site and easily used as required. It is therefore ideal for in-community testing and provides a cost effective, time saving alternative by avoiding the need to prepare test solution under clinical conditions. What is the correct dosage for Rapilose® OGTT Solution? 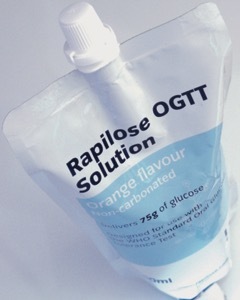 In glucose tolerance testing, the standard dose for an adult is one pouch of Rapilose® OGTT solution (300ml/75g glucose). However, it can be easily adjusted to paediatric applications based on body mass. The dose for children who weigh less than 43kg is 7ml (1.75g glucose) per kg of body weight. The total children’s dose should not exceed 75g. Please click on the embedded hyperlink to download our ‘Rapilose® OGTT Paediatric Dosage Calculator’ spreadsheet. What ingredients does Rapilose® OGTT Solution contain? Rapilose® OGTT contains the following ingredients: water, glucose syrup, glucose monohydrate, flavouring, citric acid (acidity regulator), potassium sorbate, sodium benzoate (preservatives). What are the Nutritional Values for Rapilose® OGTT Solution? How does a 300ml pouch of Rapilose® OGTT Solution deliver 75g of anhydrous glucose if it contains only 71.5g of carbohydrate? While each 300ml pouch indicates contents of approximately 71.5g of carbohydrate, the glucose is contained in a variety of sugars that breakdown on digestion to deliver the 75g anhydrous glucose equivalent. Specifically, the solution itself contains a mixture of both glucose syrup and glucose monohydrate. However, the glucose syrup is not 100% pure dextrose and contains minor amounts of other complex sugars that are metabolised to dextrose units on consumption. At the point of production, the amount of dry glucose substance in the glucose syrup raw material is analysed and each batch manufactured is adjusted as appropriate with glucose monohydrate. Using standard conversion factors for each of these minor sugars we can determine the anhydrous glucose equivalent on digestion. Each production run is carefully adjusted to accommodate any variations in the sugar ratios in each batch of glucose syrup. This allows us to ensure a precise total anhydrous glucose content of 75g per 300ml pouch, whilst maintaining a pleasant tasting and stable formulation. However, the nutritional information on the packaging per the carbohydrate content reflects current EU standards for the labelling of such food products. What is the shelf-life for Rapilose® OGTT Solution and are there any special storage conditions? When stored unopened a shelf-life of 18 months can be expected at room temperature. Where is Rapilose® OGTT Solution manufactured? The product is manufactured in the Netherlands and conforms to all required UK and EU legislation. Penlan Healthcare ("Penlan") is a private pharmaceutical company specialising in the development and marketing of products that meet the needs of Patients, Healthcare Professionals and Healthcare Systems.